A flareup inside the fire burning south of Temecula for nearly two days sent thick smoke and flames up Sunday, but firefighters said the intense fire was well inside the blaze’s perimeter. A total of 150 firefighters were on scene, officials said. Reports of the fire first came at 3:10 p.m. Saturday, according to the California Highway Patrol. It’s located along Rock Mountain Drive near Sandia Creek Drive, just south of the Riverside County line. 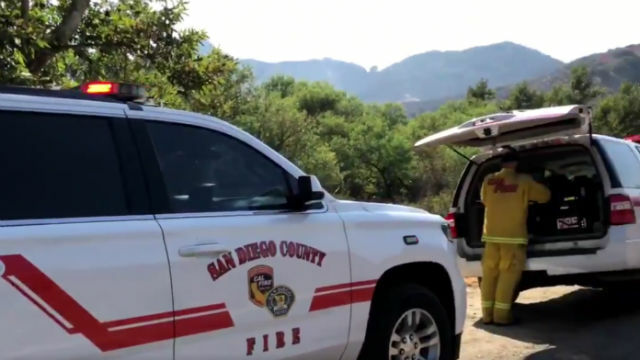 The fire was estimated at 25-30 acres as of about 4:30 p.m. Saturday, according to the San Diego County Sheriff’s Department. It quickly spread to more than 200 acres before firefighters were able to stop its forward spread by about 7:15 p.m. Saturday. About 100 homes were evacuated, but those orders were lifted Sunday afternoon, according to Cal Fire. Authorities in Riverside County said they did not believe the fire had spread into their jurisdiction, although smoke inundated much of the Temecula Valley. Sandia Creek Drive continued to be closed between De Luz Road and Riverside County. Rock Mountain Drive was also closed between Sandia Creek Drive and the county line.